Acupuncture Caulfield VIC. Qi Crystals. Alexandria Page-Robinson. Who is Alexandria Page Robinson? 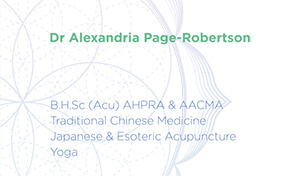 ALEXANDRIA PAGE-ROBERTSON practices Chinese medicine & acupuncture Caulfield VIC. Alexandria is a fully registered practitioner (AHPRA & AACMA) of Traditional Chinese Medicine. Having completed a Bachelor of Health Sciences degree in Acupuncture at Victoria University (with Honours) in 2002. What Methods Does Alexandria Use Besides Acupuncture? Alexandria is also a Bowen Therapist, with over 18 years clinical experience using the technique. Her ongoing commitment to Eastern medicine has also led Alexandria to undertake Post-Graduate studies specialising in Japanese Acupuncture (Manaka, Shimamura and Kiiko Matsumtoto systems), Chinese Herbal Medicine (RMIT) and Alexandria has also attended courses in India studying Traditional Tibetan and Ayurvedic Medicine (Dharamsala) as well as training as a Yoga instructor since 1999. Alexandria has over 16 years clinical experience in acupuncture and teaching yoga, and a passionate enthusiasm for exploring wellness, health and spiritual awakening through a variety of traditions and practices. A mother of 3 children, her soul purpose is to bring this work into the world so that her children may grow up in a world of peace, wellness and evolved consciousness. Is Acupuncture covered by Private Health Funds Covered When you get Acupuncture in Caulfield? Private Health Cover Rebates are available for most funds, depending on patient’s level of extras cover. Discounts available for pensioners, healthcare card holders and children.